Can the Senate Shrink the Supreme Court? Ray Raphael’s The U. S. Constitution: The Citizen’s Annotated Edition (Vintage, 2016) is now available as an ebook. 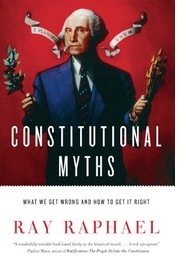 Among his nine previous books on the Founding Era are Mr. President: How and Why the Founders Created a Chief Executive (Knopf, 2012) andConstitutional Myths (New Press, 2013). Two weeks ago, Senator John McCain announced that he would oppose “any Supreme Court nominee that Hillary Clinton, if she were president, would put up.” Should Democrats win the presidency but not the Senate, other Republican senators will be under intense pressure from their base to follow McCain’s line. In this scenario, with one seat already vacant and three justices aged 78, 80, and 83, the Supreme Court could dwindle to five or six by the year 2020. Might that unprecedented move be permissible under the Constitution? Some say yes. 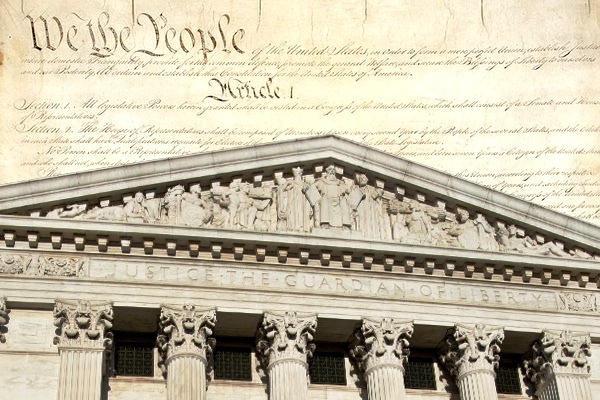 According to Ilya Shapiro, Editor-in-Chief of the Cato Institute’s Supreme Court Review, the Constitution permits it: “As a matter of constitutional law, the Senate is fully within its powers to let the Supreme Court die out, literally.” Jonathan Adler, in the Washington Post, argues that the Senate has no “constitutional duty to consider a Supreme Court nominee.” These and others note, correctly, that the Constitution is notoriously silent on what constitutes “Advice and Consent,” and so, they contend, the Senate can decide on its own exactly how to offer its advice and consent. It can hold hearings, or not. It can consider individual nominees or dismiss them all, point blank. There is nothing in the Constitution that says it can’t, they conclude. In fact there is. Three provisions are relevant. Article II, Section 2, Clause 2, states that the president “shall nominate, and by and with the Advice and Consent of the Senate, shall appoint … Judges of the supreme Court.” Note the word “shall,” appearing twice: this is both a grant of authority and an obligation. Note also the placement of this clause. It is not listed among the eighteen powers of Congress in Article I, Section 8, but appears within the short list of presidential powers and obligations in Article II, which covers the executive branch. If Republican Senators pledge not to consider Clinton nominees, the president would have absolutely no say in determining Supreme Court justices. Unilaterally, the Senate would deny the president an authority expressly granted to that office by the Constitution. True, that authority is not unconditional, but in this case the president would be bypassed entirely. That was not the intent of the framers, nor is it a reasonable reading of the text. Now consider Article III, Section 1, which grants Congress the authority to create the federal judicial apparatus. By legislative acts, the Supreme Court at various times has had six, seven, nine, and ten justices. The law currently in force, 28 U. S. Code § 1, states: “The Supreme Court of the United States shall consist of a Chief Justice of the United States and eight associate justices, any six of whom shall constitute a quorum.” (This number has been in effect since 1869. Note that if the Court shrinks to five, it will indeed “die out, literally.”) Senate Republicans who do not wish to fill Antonin Scalia’s seat have an orderly, constitutionally-sanctioned way to proceed: they can draft a bill to overturn existing law. They can stipulate, for instance, that the present vacancy, and perhaps the next one or two vacancies, not be filled. If that bill passes both the Senate and the House, and if the president signs it or Congress overrides a presidential veto, it becomes law. There is precedent for this. The Judicial Circuits Act of 1866 reduced the size of the Supreme Court by stating that the next three justices to leave would not be replaced. Of course Republicans have no interest in following this legal route. They would not likely muster two-thirds of both the House and the Senate to overturn a presidential veto, and besides, they care only about the Court’s composition, not its size. Their blatantly partisan agenda is to disrupt the Constitution’s time honored system of checks-and-balances by boycotting Section II, Article 2, Clause 2. Unless they hold all the cards, they refuse to play the game. They will wait until they control the both the executive and the legislative branches, and that will guarantee control of the judiciary. Finally, consider Article II, Section 2, Clause 3, which states that the president “shall take Care that the Laws be faithfully executed.” Again, shall implies an obligation. One of the laws that the president shall execute is 28 U. S. Code § 1. For the Senate to ignore categorically all nominees prevents the president from fulfilling this duty. How the Senate offers advice or determines consent is indeed its own business, but doing nothing at all leaves the president, not to mention the Supreme Court, in the lurch. The Senate’s inaction undermines the foundational role of the chief executive, which is to secure the efficacy of government. Republican stonewalling is already gutting the judicial system. Since the party took control of the Senate in 2015, that body has confirmed only 29% of President Obama’s nominees to federal district and circuit courts. By contrast, the Democrat-controlled Senate, during a similar time in 1987-1988, confirmed 70% of President Reagan’s nominees. Thirty-seven vacancies have been classified as “judicial emergencies,” in which the court is unable to keep up with its workload. The obstructionist strategy of leaving judicial seats empty subverts the central thrust of the Constitution. The overarching goal of the framers was to create a government that would be "vigorous" and "efficient" – favorite words of theirs. To erode the efficiency of government in the name of the Constitution is, in spirit, unconstitutional.